Amazon Prime Membership costs £79 per year in the UK but brings a whole bunch of benefits for regular Amazon shoppers. You get unlimited free one-day delivery on millions of 'eligible' items, unlimited streaming of more than 15,000 movies and TV shows via Prime Instant Video, the ability to 'borrow' thousands of Kindle titles and more. And now you get free unlimited photo storage too. You can view your photos via a regular web browser, or download free iOS or Android apps to view and upload them on your smart device. You can arrange to have photos taken on your smart device uploaded automatically, either as a backup measure or to free up storage space on your device. There are plenty of other ways to store and share your photos online, of course. Flickr is free, offers 1Tb storage and also comes with free mobile apps. It's pretty tough to fill up 1Tb with photos, especially if you're reliant on domestic broadband upload speeds to do it. Apple fans have iCloud Photos, still in beta, though there is a 5Gb capacity limit and more will cost extra. Google fans can use Google+ Photos, though while this does offer unlimited storage, any images measuring more than 2,048 x 2,048 pixels will start to eat into your allowance. DropBox offers 1Tb storage if you take out a Pro subscription and a Basic SmugMug account will give you unlimited storage at much less than the cost of an Amazon Prime account – and with organising, editing, sharing and album tools thrown in. Amazon Prime Photos could be a killer feature if you're already an Amazon Prime customer or you're teetering on the edge of joining. 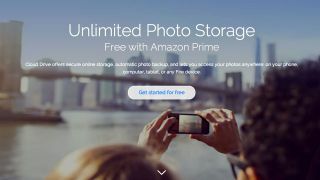 It doesn't look that compelling as a photo storage/sharing solution on its own, though, so you'd need to want all the other Amazon Prime benefits too.